We've partnered up with the fabulous guys over at EDTracker to bring to you the EDTracker bundle in it's entirety. We were previously selling bundles with a blank PCB, which you can still purchase here; however, we're now in a position to sell you an entire kit, which include the EDTracker PCB. Dan Howell created and uploaded the following video which demonstrates how to create a DIY Headtracker. Excellent video! Thanks Dan. HCKITS0021: Pro Micro, GY-521, Switch. HCKITS0021B: Pro Micro, GY-521, Switch and blank 3x7 PCB. HCKITS0021E: Pro Micro, MPU-9250, Switch and blank 3x7 PCB. HCKITS0021F: Pro Micro, MPU-9250, Switch and EDTracker PCB. HCKITS0021G: Pro Micro, GY-521, Switch and EDTracker PCB. HCKITS0021H: Pro Micro, MPU-9250, Switch, EDTracker PCB and Enclosure. HCKITS0021I: Pro Micro, GY-521, Switch, EDTracker PCB and Enclosure. Please note that the bundle previously came with the 9150 module. This has been discontinued by the manufacturer, and has been replaced with the MPU-9250. If you have purchased the EDTracker from Hobby Components with the EDTracker PCB, the build guide can be found further down this page. EDTracker have also supplied a drill guide for correct positioning of the switch hole within the case. This can also be seen further down the page. NOTE: The 9250 MPU includes a magnetometer and is recommended. The 9250 supplied by Hobby Components can accept a 5V power input - If you purchased the 9250 elsewhere, please be sure to check as some are only 3.3V tolerant. 1x Pro Micro Arduino development board (or compatible) ATmega32u4 16MHz microcontroller. 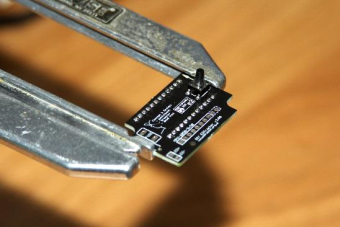 1x GY-521 or 9250 Gyroscope development breakout board (5v tolerant). 1x 6mm momentary tactile button. 1x Soldering iron with suitable tip for small PCB work. 1x DIY EDTracker board (Version 3.0). Read carefully – the order of components is important! In particular, it is easier to leave the header pins out of the MPU board initially. The TOP of the EDTracker board has the writing/logo. The blank side of the board is the BOTTOM. 1. If you plan to put your device inside an enclosure, use a file to gently remove any remaining tags off the 4 sides of the PCB. The edges should be smooth and flat. 2. Solder the button into the top of the board first. Pay attention to its orientation – the pins should align and push into place with minimal pressure; they do not need bending or splaying apart. 3. Flip the board over; you are now looking at the underside. Place the header pins for the Arduino into the board (two rows of 12 pins) - short ends into the PCB, long ends protruding. 4. 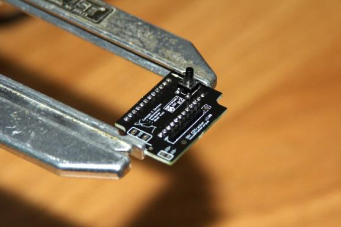 Place the Pro Micro onto the pins and solder it into place. Note the orientation of the USB connector – it should be at the same end of the PCB as the button. 5. 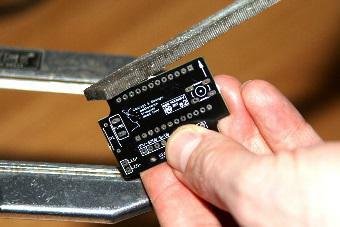 Flip the board back over to the top, and solder the other side of the Pro Micro pins into the board. Although not usually necessary, you can trim the pins so they do not interfere with the MPU board later. 6. Insert the MPU header pins. If you have an 8-pin board (MPU-6050/9150), you can leave the 2 end pins unpopulated (dashed outline). 7. 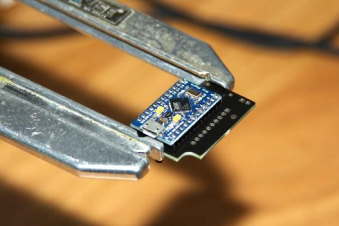 Flip the EDTracker PCB over and solder the header pins in place; ensure you keep them level – if loose, the header will have a tendency to want to drop out of the PCB. 8. Finally, flip back to the top of the PCB and solder the MPU board onto the row of header pins you just completed. The board is now complete. Plug in a USB power source. You should see a red LED light on the Pro Micro board (subject to model variations). Typically MPU-6050 and 9250 boards have a power LED also – but we have noted most MPU-9250 breakouts do not include a power LED. Please consult the project website for the latest up-to-date procedures documented in the User Guide (under Downloads). Flashing your device can be done entirely from the EDTracker GUI and there is no need to compile source code if you don’t want to. The website also provides links to the GitHub code repository; the code is under constant development. It is important to perform the calibration steps prior to use. Failure to do this can result in axis creep over prolonged periods of time. All details are available in the manual, which is available underneath the Downloads section. 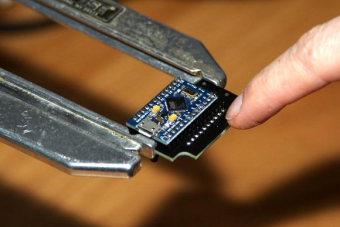 Make sure you download the correct manual and GUI software for your DIY device (MPU-9150 or 9250 users should download the manual for magnetometer-enabled devices). Any questions and I will also endeavour to help. One minor point on the Rev 3 PCBs there are some additional marked locations ("FUSE", "R1", "LED+", "LED-"). These are not mandatory and are currently not used by the design; you can leave them blank when building. They are there for those who want to "tinker" with making a hybrid infra-red point tracker powered off the same PCB; 1 or more IR LEDs that can be tracked by an infra-red camera. The idea behind including them on the board is that they are there for people who know what they are doing. 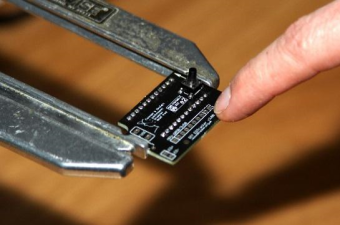 Fit a suitable PTC fuse to the "FUSE" location, bearing in mind that USB can provide no more than 500mA to the entire board under USB 2.0 specs. Your value will depend on the number of IR LEDs and their current draw. 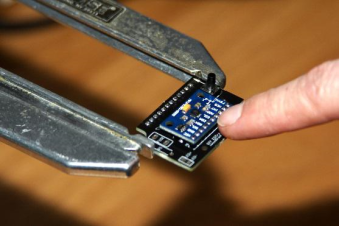 R1 is a current limiting resistor which will again depend on your configuration of LEDs. Finally the supply can be fed to the LEDs via the "LED+/-" header pins. As said, none of this is necessary for your EDTracker experience - you get 3DOF tracking via EDTracker without populating any of these. I purchased the bundle that came with the button, MPU 9250 and the Arduino and I bought the PCB and enclosure directly from Edtracker (Bad timing, I ordered it JUST before the complete bundle was available here). I'm able to flash the Arduino with the EDTracker2_9250 4.0.5 successfully using the 4.0.4.0 GUI. However it appears I'm not getting any data from the MPU. The temperature reads 0 and all the Bias values are 0. I double checked all my connections and verified continuity between the MPU/button/Arduino and that nothing was bridged. I even went as far as removing the MPU and resoldering it back on. I've also confirmed that the button is not stuck by confirming the lack of continuity between the points on the button (and confirming continuity when the button was pressed). In the video is says to make sure to wire the button correctly, which with the custom PCB it seems like it would be difficult not to. It just fit right in, so I'd imagine it's in correctly. It appears that the MPU breakout board doesn't have an LED at all so I'm not sure if it's powered up or not. On the Arduino, the RED LED stays solid and occasionally the yellow light flickers. After sitting for several minutes, the GUI occasionally pops of a message saying "Calculating Gyro Bias" and will attempt to do until I click dismiss. What else can I do to check? Is there any way to debug the MPU to try and isolate the problem? Right after posting the above comment, I had an idea. I check the datasheet of the MPU and found out which pins connect to the points on the breakout board. I checked continuity between all the pins we use VCC,GND,SDL,SDA,AD0,and INT and discovered that I didn't have continuity between the INT breakout point and the PIN on the MPU (pin 12, right most bottom pin). Looking at it closer I noticed a divot in the PCB where the trace from the INT point and the PIN. Infact, it looks like even the bottom right most capacitor is not aligned correctly. Assuming the INT trace is broken, is there a way to not use INT? I saw in some of the other videos that you can change the mode to polling, however I don't see this as an option in the GUI. First of all be careful when checking continuity at solder joints, the solder has a resin flux in it that can coat the outer surface solder. Make sure you have a good contact with your probe. This sketch doesn't use the INT pin so if that's your problem it should work. Hi Andrew, thanks for the reply! I ended up buying the same MPU breakout board here locally and swapped out suspect one. Sure enough everything worked perfectly. I dug the shipping box that the MPU came in from hobbycomponents and sure enough, there's a nice hole in it where it looked like it was smashed during shipping. I guess I'm used to receiving packages mangled in the mail so it didn't occur to me that the contents were damaged. It's painfully obvious now in hindsight. Thank you for the link to the test sketch. I wasn't really familiar with Arduino development but this has definitely inspired to learn more. A huge thanks to brumster and the team for such a awesome project! The youtube videos and all the documentation were massively helpful! Sorry about that, we will replace or refund any damaged item. Just send an email to sales [at] hobbycomponents dot com referencing this thread and we can sort it out from there. If you do, and you still have the packaging, it would be appreciated if you could also attach a picture of that to the email and also if you see any physical damage to the module a picture of that also. As you have already reported a problem there is no time limit on this. Ordered and received kit, built... worked awesome! Unfortunately after only the second day of use, when attaching it to my headset with some tie wraps I somehow pushed too hard on the cable accidentally and heard the awful sound of a micro USB connector popping off the board Yes, there was a clear warning... this was my own fault. What are my options to fix this? Do I need to replace the Pro micro board and desolder all the headers to do that, or is it better to just get a whole new kit and rebuild? I tried unsuccessfully to reattach the connector but it's just too small for me to solder. 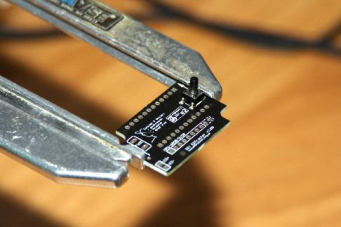 Is it possible to solder another usb port directly to other pins on the pro micro (I see some labeled Tx Rx...etc) or does it have to be the same tiny connectors where the micro usb was? Last edited by halightw on Thu Jun 29, 2017 3:09 pm, edited 1 time in total. For the microUSB connector the biggest problem is that it has a tendency to rip the pads off the PCB with it. Especially the tracks connected to its pins as these have to be quite thin. I'd check to see if any of the pads/tracks have been pulled off the PCB first for attempting to replace the connector. If they are intact then this may be your easiest and cheapest option. If not, the next option would be to try and replace the Pro Micro. Desoldering it will be tricky though and you need a desoldering tool. 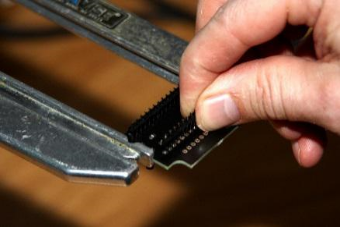 One tip if you don't have anything that can desolder the entire connector in one go is to carefully snip each pin so you can remove them separately. Failing this its either a new kit, or sending it back to us to see if we can repair it for you. However as your not in the UK the shipping costs may not make this a viable option. If you do plan to purchase a replacement part or a new kit email sales [at] hobby components dot com and reference this post and we'll see what we can do for you. Thanks so much for the reply; yes I think the pads are right off... I have attached a picture to this post so everyone can see what happened. I've never attempted to desolder something like this before, I'll give it a go to see if I can salvage things and order replacement parts from you, and probably another whole kit just in case my attempt fails! Again thank you; excellent customer service and I will highly recommend you to all my friends.